The book gap: For children in poverty, one of the biggest obstacles to literacy development (which begins at birth) is the scarcity of books in the home. While the ratio of books to children in middle-income neighborhoods is approximately 13 books to 1 child, the ratio in low-income neighborhoods is a mere 1 book to 300 children. The Children’s Book Bank narrows the book gap by providing the community with a place for families donate the books their children have outgrown, moving thousands and thousands of children’s books into the homes of kids in need. 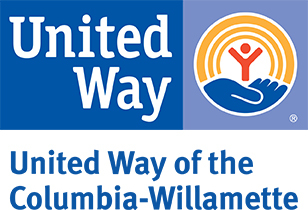 Sign up below to come lend a hand as we spruce-up community donated books which will later be distributed to low-income preschool children in the Portland area! Every gently-used donated book is inspected and cleaned by volunteers. Tasks include wiping covers, taping torn pages, erasing scribbles, covering inscriptions, and reinforcing worn spines. Is this a place I can bring my children? Young volunteers are welcome at Children’s Book Bank with parent help. Please follow the instructions below to reserve a spot for your child. Can I bring books to donate? Yes, of course! You are welcome to bring either new or gently-used books with you to this volunteer event. Children’s Book Bank serves children under the age of six, so donations of “read aloud” books are greatly appreciated. Books in Spanish are a particular need. And if you're interested in learning more about hosting a book drive for the Children's Book Bank, we'd love to hear from you! Email info@childrensbookbank.org for more information. Where do the books go? Children’s Book Bank partners with local agencies to identify families and children in need of books. Last year every Head Start preschooler in Multnomah County received a bag of 15 books of their own to have at home. Volunteers must be 6 years of age or older to attend this project; any volunteer under age 15 must attend with a parent or adult chaperone. Click "Sign Up" below to reserve your spot! Need help signing up? Call 503-200-3355.